Teeth whitening is the most popular cosmetic dental treatment in the UK. It’s a fast and effective way to improve the appearance of your smile. The single most important thing to remember when looking for teeth whitening treatment is that it must, by law, only be carried out by a dentist, or a hygienist on a dentist’s prescription. Teeth whitening is classed as dentistry by the General Dental Council (GDC) and should be considered in the same way as any other dental procedure. Unfortunately, there are still beauty salons offering whitening treatment. They claim that it is a cosmetic and not a dental procedure. This is a lie and the GDC will prosecute anyone offering illegal dentistry. Treatment from unqualified providers can be seriously damaging to your teeth and gums. Whitening products bought from the internet should also be avoided.They have often not been tested to the standards required of products used by dentists, don’t actually work and could be dangerous and cause damage to your teeth and gums. What about the whitening products found in chemists and supermarkets? Whilst these are likely to be safe enough, they are also likely to be ineffective as they won’t contain enough of the product needed to whiten your teeth. 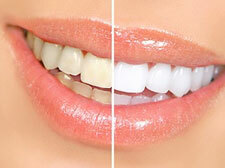 There are two options for teeth whitening at Langmans Dental Health Centres – Zoom Whitening and Home Whitening. Zoom Whitening involves an appointment with one of our hygienists. They will carefully shield your gums and lips before applying a whitening gel to your teeth. A special lamp is then shone on your teeth to activate the gel. In just one hours time you can have a brighter smile! We also provide a home whitening top up kit with custom fit trays for you to take home. Home Whitening involves using custom made whitening trays which are made from an exact mould of your mouth. You place a small amount of gel in these trays and wear them either over night or during the day until you reach your desired shade. This usually takes around two weeks but can be longer for people with severe staining. It is important to note that teeth whitening won’t lighten any fillings, crowns, veneers etc. but any that are visible could be replaced after whitening to match your new tooth shade.